When I first visited Australia I was impressed. The people in Sydney were extremely friendly and proud of their country. In a pub, after I learned that Fosters Lager was considered swill (like America's Budweiser) and drank many mugs of the "good stuff," I was told that I'd miss Australia when I finally left. "Stay here as long as you can, mate. We're a peaceful country. We don't have a history of wars or being militant. You will love it here." Boy, was that ever right on the spot! But as you get away from the "average bloke," you begin to see that the government of Australia starts to resemble that of America. There is indeed a militant faction that seeks to force its wishes upon the peace-loving people, even when it opposed everything good that embodies the "land down under" and sets it apart from other aggressive countries. This paradox is exposed in a situation known as the "Australian Apocalypse." It involves a beautiful collection of 42 islands and islets on the West coast of Australia -- called the Dampier Archipelago -- that contains the world's largest collection of rock art comprising at least 600,000 extremely ancient petroglyphs and millions of stone arrangements dating back to the last ice age. Were this ancient museum of human history located in other countries it might be designated a World Heritage Site or made in to a National Park. But the Australian government has chosen to use this site for other purposes. Starting in 1963 and continuing through 2004, the government of Western Australia allowed the islands to be used for huge petrochemical plants and storage facilities, destroying about a quarter of the petroglyphs outright and eroding those that remain from chemical residues. 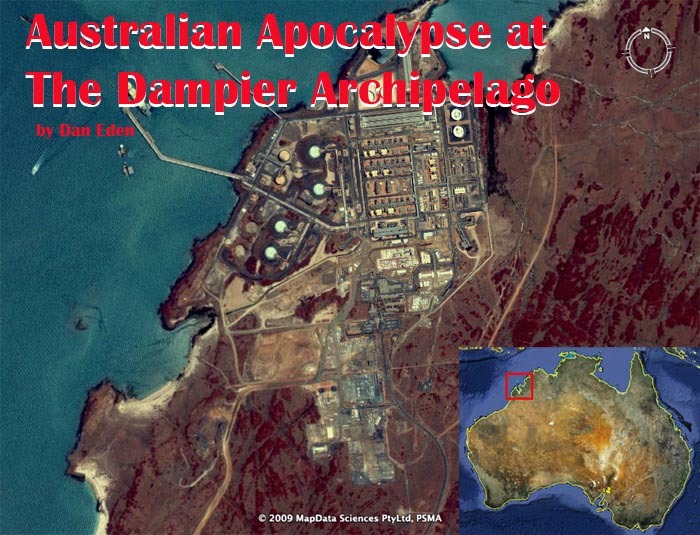 Although the actual Dampier site measures just a few square kilometers, they have already crammed explosive material there equal to 1,500,000 tons of TNT or the same potential as 100 Hiroshima-size bombs! New plans, opposed by a majority of Australians, would add an additional equivalent of 1,800,000 tons of TNT, or the equivalent of 120 Hiroshima-size bombs! 4 LNG tanks, a total of 260,000 m3 of liquified gas. 2 LNG tanks, a total of 320,000 m3 of liquid gas. 3 Condensate tanks, a total of 120,000 m3. The combines explosive power will equal 220 Hiroshima-size bombs! "The gradual destruction since 1964 of the Dampier Cultural Precinct, Australia's largest cultural monument, is unquestionably the planet's most serious case of state vandalism in recent history. It exceeds the extent of cultural heritage destruction caused by the former Taliban regime of Afghanistan." The concentration of such a huge explosive potential -- equivalent to 220 Hiroshima-size bombs -- presents a potential danger that boggles the mind. Industry experts claim that LNG facilities are safe and pose a low risk; however, history tells a different story. In the Southern Ural Mountain area of Russin, a blast in 1989 killed 575 people and injured over 700. In Chongqing Province, China, a 2003 explosion killed 234 workers and injured 500. In Skikda, Algeria, a 2004 accident killed 27 workers and injured 72. In Ghislenghien, Belgium, a 2004 accident killed 23 and injured more than 120. Since these LNG facilities are usually located in remote areas the human damage is small. 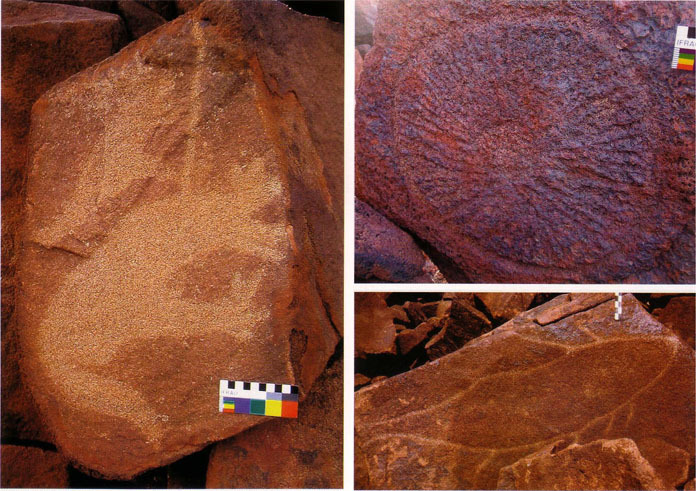 What worries Australia's citizens at Dampier is the potential to totally obliterate the ancient rock art. In America, our cultural heritage goes back about 400 years, when the first Pilgrims landed from Europe. Our indigenous people, the Native American Indians, have a culture that goes back about 10,000 years to the Clovis People. But all we have of these distant cultures could fit inside a shoebox and consists of fragments of charcoal and a few spear points. We know virtually nothing of their thoughts or traditions -- i.e. what makes them "tick." In Europe and Asia we have a similar scarcity of artifacts dating back to about 20,000 years, reflected in a few cave paintings and more flint tools. But in the Dampier Archipelage we have so much more. We have art, drawn or pecked in to stone for ritualistic, educational and religious purposes. Most has not yet even been evaluated by archaeologists and is a detailed history of the human race waiting to tell its story. The area where most of the petroglyphs are located is quite small and concentrated. It measures about 27 by 5 kilometers. An examination of the topography reveals that these islands were originally connected to each other and to the mainland of Australia at a time when the ocean level was much lower. Scientists estimate that the sea invaded most of the lowlands some 6000 years ago. Most likely, the sea now claims a large portion of the petroglyphs, making the remaining glyphs all that more special and valuable to historians and archaeologists. In 1960 a causeway and rail system was constructed to connect the islands with the shore, but the area has remained largely unstudied and underappreciated. This is largely because the region of Western Australia is itself remote and underpopulated. 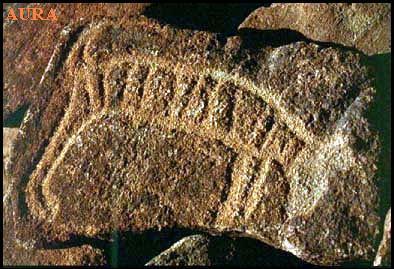 Archaeologists who do make the effort to visit the petroglyph sites are extremely surprised by the variety, quantity and age of these ancient images. One way to look at the site is to consider it as a very ancient museum. At a time before humans developed a language or system or writing, pictures were used to record events and express ideas. The area is literally a history book, written upon rock, that tells the story of humanity going back to the pleistocene era. Some sites are from 40,000 to 60,000 years old! Petroglyphs are made using any of three techniques. The most common in known as "pecking" where a sharp stone has been used to chip away the surface of the granophyne stone (an extremely fine grain ans hard rock compound). The surface is usually a darker color because of atmospheric oxidation, called patination, and the underlying rock is a lighter color, making the petroglypjs highly visible. Another technique is to use a sharp stone to scrape the surface of the stone, revealing the lighter underlying rock. The third method is called "bruising" where a stone is pounded againt the surface, compressing it and causing particles to fall away, revealing a lighter color. Most of the images are of animals, fish, birds, mammals -- including some that are long extinct -- and spirits.They represent legends, achievements, fantasies and perhaps even music of the earliest human beings. 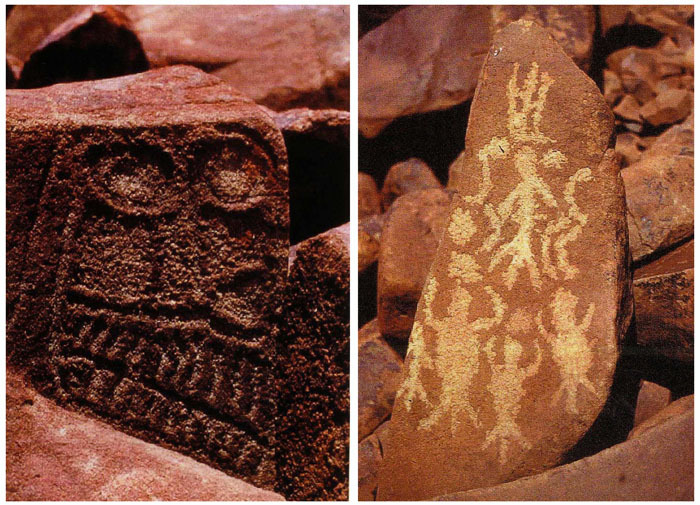 Some of the petroglyphs have repeating images with each image being slightly different. This used to puzzle archaeologists until they realized this was an ancient method of animation. In this way, dances and hunting techniques could be recorded in "steps" that were understood by the viewer. 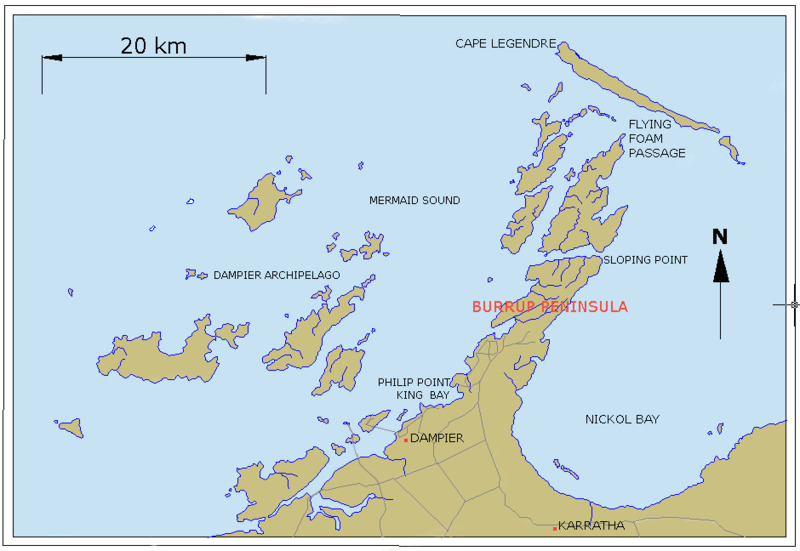 The ealiest recorded inhabitants of the Dampier Archipelago were the Yaburara people. Unfortunately they were killed in a shameful massacre over an eight day period in 1868, a dark episode in Aboriginal history called the "Flying Foam Massacre." Modern men have advanced much with our technology and science, but at what cost? So-called "primitive" humans were more in touch with nature, the earth and felt connected to both in ways that modern men have forgotten. Perhaps this art can stimulate some archetypal memories of what it means to be human and part of nature, instead of the creatures that have evolved to manipulate and control it. In 2001 the Australian government (Western Australia) tried to make reparations by deeding the land back to the Aboriginal people but stipulated that they would have to lease the land back to the government for 99 years. The agreement also stated that the Australian government could do whatever it wanted with the land and was not required to consult or seek approval from the Aboriginal people. This Burrup and Maitlans Industrial Estates Agreement is what prevents the Aboriginal people from protecting their cultural land and artifacts from being destroyed. Concerned groups of Australian citizens have tried to ban industaial use of the land, but it appears their efforts are too late. The huge complex, containing mostly explosive gas and fuel, is there to stay. Instead, groups have been attempting to ban future expansion of the area. The World Monument Top 100 Endangered Sites now lists Dampier as one of their top priorities. 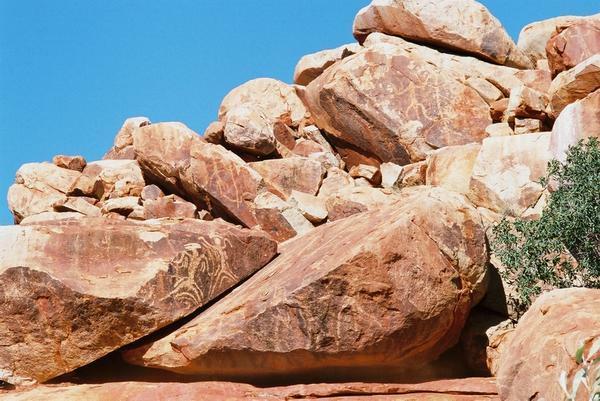 Further, the Australian Aboriginal Heritage Act (Section 18) prohibits the destruction or removal of rock art and this violation is being contested by both sides. 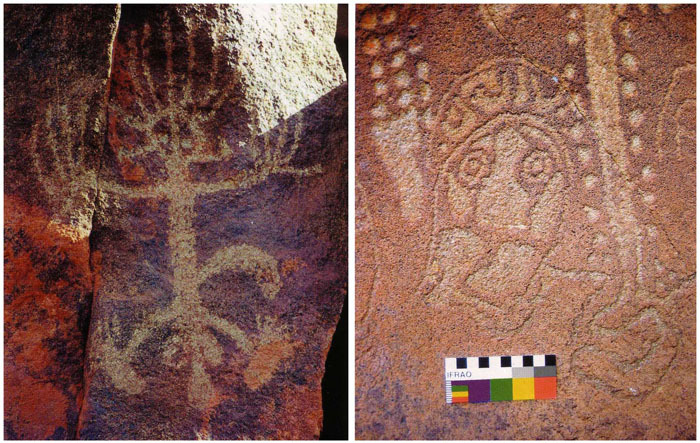 Recently the destruction of the rock art sites by residual chemicals, vapors and byproducts has come to the attention of UNESCO, who declared these acts to be a destruction of International Cultural Heritage (October 2003). Sulphur and nitrogen is rapidly eating away at the patina on the rocks, eroding the petroglyphs that have, until now, endured tens of thousands of years! What can be done? Solutions have been suggested... coating the rocks with a protective resin, moving the rocks to a more accessible and less dangerous location... but time is running out and the funds for such remedies are not to be found. Perhaps extensive documentation with digital technology might be an immediate step to conserving the art for future study. This is an approach that we, at viewzone, support. But we want you, the reader, to tell us what you think should be done. Please write to us.